A large part of my job as a veterinarian is practicing preventive medicine. As pets age, they are prone to a variety of different diseases, many of which can be diagnosed early through a simple blood test. 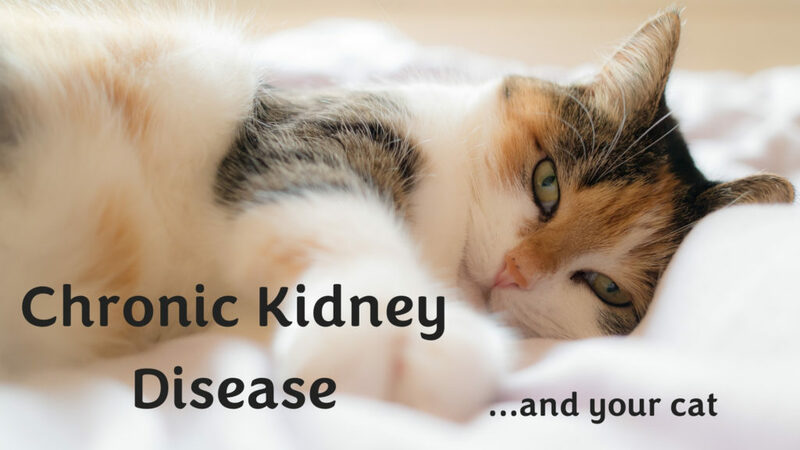 One of the most common diseases diagnosed in our feline patients is chronic kidney disease (CKD). Cats with CKD may demonstrate the following: increase thirst, urination, weight loss, decrease in appetite, and vomiting. If you feel that your cat may have any of these signs, it is important to discuss your concerns with your veterinarian. CKD is a progressive disease where the underlying cause of the kidney insult is often not determined. Patients usually have elevated kidney values on blood tests and poorly concentrated urine. More advanced cases can develop increases in blood pressure, anemia, and imbalance of potassium, phosphorous, and calcium. It is important to realize that not every cat with CKD has all these imbalances, so therapy may differ from one affected cat to the other. There are four stages of CKD, one being the mildest and four being the most advanced. Intervention is routinely instituted in stage two or three. The main goal of therapy is to help slow progression of CKD. This is often attained through diet change, increasing water intake, treatment of high blood pressure and correcting electrolyte abnormalities. Diet alteration is a mainstay of treatment for cats with CKD. 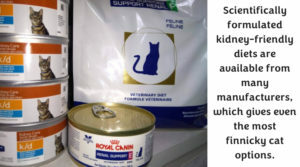 As kidney disease advances, cats often have difficulty with phosphorous balance. Kidney diets are restricted in protein which reduces the amount of phosphorous the cat is eating. Prescription kidney diets are strongly recommended and are fed for life. When selecting a diet, it is important to provide the cat with a variety of different options to find one that the cat will enjoy. 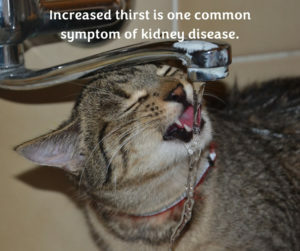 Cats with kidney disease are also prone to dehydration. Ensuring they are receiving adequate amounts of water is necessary. Canned diets are recommended over dry diets due to the increase water content found with canned food. When diet is not enough, veterinarians may ask owners to provide additional fluid supplementation through subcutaneous fluid administration. It is recommended to have a physical exam, blood pressure check, urinalysis, and blood work performed every 6 months to monitor the advancement of kidney disease. For those cats that do not like to go to the vet office, at home monitoring through our mobile veterinary service, SVA On the Go, is a great option. We all know the struggle of putting our cats in carriers to take them to the vet, the more we can do to reduce stress in our feline patients, the better. Please consult your primary veterinarian for more information on CKD.